The sign-up deadline for the ICCAMS Maths project was on Friday 24 June 2016. We are very pleased to be working with over 100 schools across England. 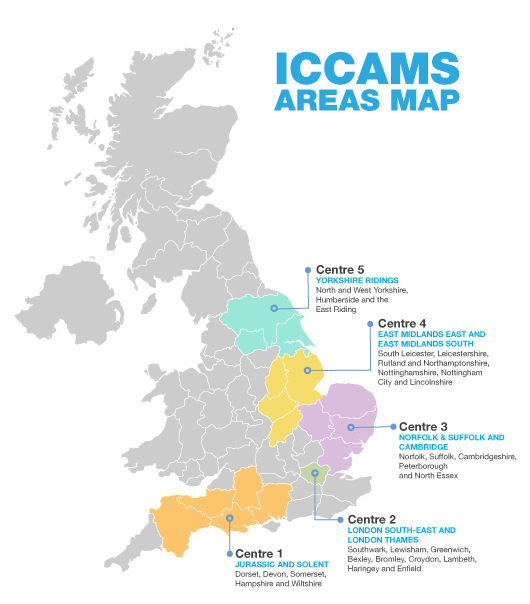 ICCAMS Maths will work with over 100 secondary schools in these five areas in a randomised controlled trial which aims to find out how effective the ICCAMS Maths intervention is at raising pupil maths attainment. The schools will be randomly allocated to get the ICCAMS Maths intervention or serve as a comparison group for the research project with half the schools in each group. Both groups are important to the study as we can’t learn anything about the programme without having a group to compare progress to. • Schools allocated to the ICCAMS Maths group will deliver ICCAMS Maths across Year 7 in the first year and continue with Year 8 in the second year. This will involve 2 lessons and 2 mini-assessment activities each month for each Y7/Y8 maths class. • ICCAMS Maths involves attendance at 6 days of PD in the first year and 3 days of PD in the second year for two staff members. These staff members receive resources and training for delivering a shorter version of the training in their department. • Those allocated to the comparison group will receive £1500 for their participation in the project (on completion of project requirements) and the resources for FREE at the end of the project.